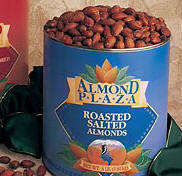 Snacks & Food Gift Baskets - Fast Online Delivery "Guaranteed"! 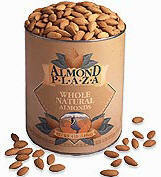 Gourmet Food Baskets, Gourmet Food Gifts, Online Gourmet Food: Shopping for Gift Baskets. 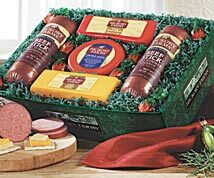 Unique custom and ready-to-give- gourmet gift baskets for every occasion and budget. Choose from a large variety of gourmet food gifts baskets, gourmet graduation food gift basket, holiday gift baskets, special occasion gift baskets, pamper gift basket, corporate gifts, new baby gift baskets, thank you gift basket. We have fresh fruit and baked goods and many more! 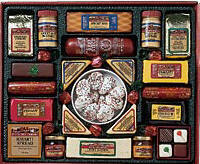 Snacks meats and cheese, beef stick sausage, tasty cheeses in one impressive gourmet food gift. Sharp cheddar, Gouda cheese and Strawberry Bon Bons, order Beef N Cheese today! Choose from many online gourmet gift baskets that are some of the most delicious you'll find this year. Our wonderful gourmet gift baskets are ideal for a close relative, choose from many gourmet gift baskets to a send to a friend who's far away, or a corporate business associate as a token of good cheer. Each of our gourmet gift baskets are beautifully arranged and wrapped so there's nothing to add but a note of good cheer! 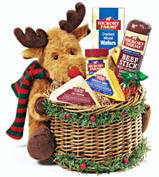 These gourmet gift baskets are our most popular gift. 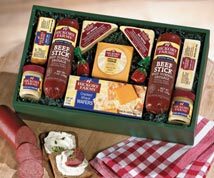 Our award-winning Beef Stick Summer Sausage and three of our most tasty cheeses in one impressive gourmet gift. With two 14 oz. Beef Stick Summer Sausages, 7 oz. each Natural Edam, Sharp Cheddar and Gouda, and Strawberry Bon Bons. 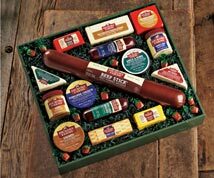 So satisfying, better order Beef N Cheese for yourself and all your friends..
Strike it rich with this bountiful gift pack. The wide variety of cheeses will add a "golden" touch to holiday snacking and entertaining. 3 lb. Beef Stick Summer Sausage, 7 oz. each Italian Spice Sausage and American Classic Summer Sausage, 7 oz. Sharp Cheddar Stick, 6.5 oz. each Marbled Cheddar and Apple Pie Cheddar, 6 oz Smoked Gouda, 6.25 oz each Sweet Hot and Honey Mustards, 4 oz. each Smoky Bar, Chavarti and Chedam, 4 oz. each Garlic & Herbs Cheese Spread, Alpinzel Swiss and Hot Pepper Triangles. Our fall tin pail is filled with all the flavors of the season. Includes 7 oz Beef Stick, 5 oz Old Fashion Crackers, 4 oz Hot Pepper Cheese, 3 oz Sweet Hot Mustard and 3 oz Mixed Nuts. Everyone has their own way of giving gifts. Home Bistro Gourmet Foods, complete dinners and appetizers has made your choice easy. Pick from an assortment of gift certificate amounts. From $25.00 to $250.00. You choose and make your gift a happy one. Food Gift Certificates. We deliver gift baskets for any occasion including sympathy gift baskets, Halloween Gifts | Get Well Gift Baskets | Anniversary Food & Fruit Baskets | Birthday Gift Baskets | Thinking of You | Hostess Gifts | Thank You | APO/FPO Gifts | Gourmet Housewarming Gift Baskets | Sympathy Gifts | Food Gift Baskets for a hearty Congratulations. Look for our Free Shipping Specials!